Buzz wants to play, but Fly Guy is downcast and drawing pictures of his family. Buzz decides to host a family reunion for his pet. He puts up signs around town, and soon the guests begin to arrive. Once they are assured there are no fly swatters, the flies come in to Buzz's house and wait to surprise Fly Guy. Not only is Fly Guy surprised, but Buzz is amazed at how many relatives flies have, and his parents are a little concerned about how to deal with the swarm of guests. Never fear! Buzz has arranged for a garbage truck to cater the event, and soon the flies are reveling in the tasty garbage. Fly Guy's parents even bring his baby pictures. After the party, Buzz cleans up and gives Fly Guy frames for some of the drawings of his family. I can see why my students mention that this series was an enormous hit in their elementary schools. Buzz and Fly Guy seem to enjoy each other's company, and the two are thoughtful with each other's feelings. The plot is preposterous enough to be funny, but also somewhat realistic. What fly wouldn't miss his thousands of relatives if her were a house pet? 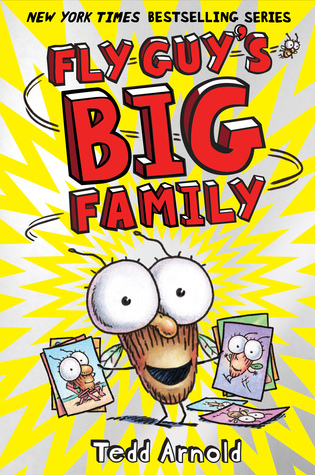 The pictures are vibrant and goofy, with fly guy's big eyes and enormous grin mirrored by Buzz and his family's Captain Crunch eyes (which go over their hair the way that Crunch's are somehow placed on his hat). A lot of emotion is conveyed by very simple lines, and the quality of the illustrations is much higher than on many early reader books. I've had a lot of struggling readers this year; Fly Guy would go over well with them, but I think the next too are strictly elementary. Also, I've never been a fan of the whole fairy/princess thing aimed at girls. Picky Reader was 4 when the tend started (2002), and although she got very into Malcolm's The Jewel Kingdom #1 series, there is only one picture of her in a princess costume! 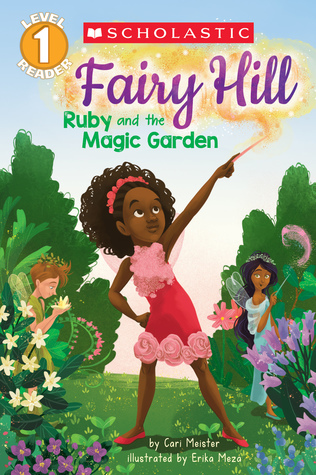 Luna, Ruby and May are young fairies who live in Fairy Hill. They are learning magic and hope to get their fairy wings from the Fairy Queen by doing a brave, kind deed. When they go to play in the fairy garden, they realize that it is not doing well. They try several strategies to repair it, but nothing works. It is important that the garden be restored, because there is a lost baby deer who needs to eat the magic clover in order to find his way home. Eventually, Ruby figures out the problem, the garden comes back to life, the deer returns home, and Ruby is rewarded with her wings. This level one reader is has simple vocabulary words (sparkle and blocking being the most difficult ones), and has 3-5 sentences on each page. Most of the space is taken up with pictures that support the text. This makes the book just challenging enough for readers but keeps the pages turning quickly. The story is engaging, and the problem is simple and easily fixed. The fairies all work together and are supportive of Ruby when she is the one to identify and fix the problem. There is a nice lesson about helping others, and a reward for initiative and hard work. The pictures are colorful and clear. The characters are easy to identify, and the backgrounds don't interfere with the text. It is nice to see diverse characters in a beginning reader. I don't know that there were many books like that twenty years ago when my daughters were learning to read. 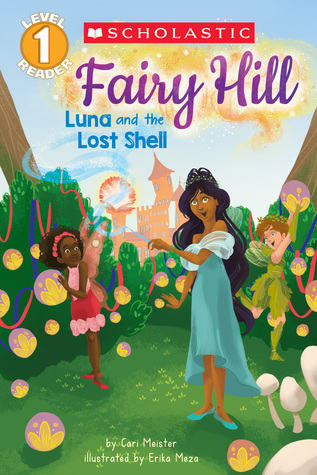 Ruby appears to be African-American, Luna could be Latina or Indian, and May breaks the princess/fairy mold by having short hair, a leafy green outfit, and an androgynous appearance. There are three books in this series so far, and considering that many early readers will go through lots of books, this will keep them reading for some time. It also provides ample inspiration to young imaginations and may inspire some magical role playing. Luna, Ruby and May are back, and this time the glow globes that are to be used to illuminate the Fairy Ball have gone dark. The trio investigates so that the party can continue and the Fairy Queen is not inconvenienced. When they realize that the magic shell that helps power the lights is missing, they track it down to the home of a chipmunk. He is using the shell as a lamp, so the fairies craft another lamp and offer it for trade. When the shell is put back in place, the lights come back on, and the party can continue. Since Luna found the shell and negotiated with the chipmunk, she is rewarded with her new wings. The Scholastic Level 1 readers have "sight words, words to sound out, and simple sentences". There are 3-5 sentences on each page, and brightly colored pictures that support the text. The story is a mix of the fairies having fun (they are preparing for the party, eating cupcakes, and are dancing at the ball after the problem is solved) and of the fairies solving a problem. Their investigative skills are used for a problem that is not too difficult to solve, and their empathy for the chipmunk helps them to quickly get the shell back. The way the pages are arranged makes it easy to use this book for predicting what will happen next. I always enjoyed doing this when my daughters were learning to read. "Why do you think the power went out? How would you get the chipmunk to return the shell? Why do you think the Fairy Queen is visiting with the fairies?" are all questions that can be discussed, and help early readers learn how plots are developed. The ball and the pretty dresses will appeal to young readers who are fond of princesses, and the message that kindness and hard work are rewarded is always a good one.